The Kava Starter Kit for 2 contains everything you need to begin enjoying kava along with detailed instructions so you can perfect your drink making skills. Comes with Powered Kava Root Plus, muslin extraction bag, kava blender, lemongrass, and two elegant hand-crafted acacia wood cups. Want to get started with an authentic Kava experience as simply as possible? Well, Kona Kava Farm has an awesome solution! – This Kava Starter Kit has everything you need to have a fun and pleasant two-person Kava experience. We’ve not only given you the best grade of Kava we offer from World-renowned Kona Kava Farm, we’ve also included detailed instructions, a real muslin extraction bag, plenty of kava blender to help your Kava drinks kick, a little bit of lemongrass to add extra flavor, and two elegant hand-crafted acacia wood cups to authentically enjoy your gulps of Kava. And, it’s all packaged in the popular and collectible Kona Kava Farm tins. Looking for a Kava Sampler Pack? – We’ve got that as well! The sampler pack gives you an idea of the various forms of Kava that are available. Whether you just want to grab something and go for a picnic, or whether you just want everything you need (except the blender) right in front of you, the Kava Starter Kit is the only way to go! We’ve only offered these for a short time here at the Kava Marketplace, but already, they’re extremely popular items. The Kava Starter Kit also makes the perfect gift. Looking for something unique? Trying to please something that is difficult to please? Well, from years of experience, I can tell you that Kava never fails to please. Even the most stalwart recipients melt when they open the tin, see the instructional card, and all the components that make this such a hit for Kona Kava Farm. 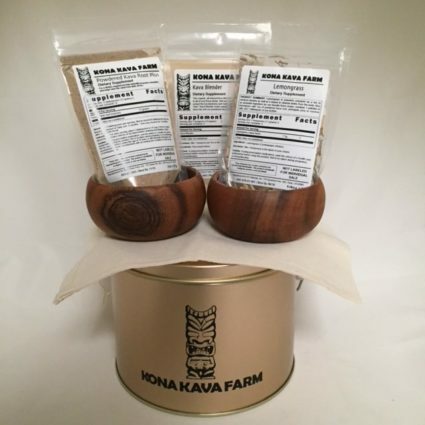 If you just want a Kona Kava Farm Tin; those are available as well. Plenty of room for Kava or anything else you want to add a little elegance to. This starter kit is the perfect introduction to a traditional kava session. You get high quality kava with two coconut cups and a strainer bag, just like they do in the islands. What a fun, chill way to try Kava! My husband and I enjoyed the tea together last night before supper – what a relaxing evening. Best sleep of my life and feeling wonderful this morning. I’m going to order more and have a Hawaiian themed dinner party with friends. Can’t wait to introduce them to Kava and the lovely ritual of gratitude and communion around it. You will want to mix 1-2 tablespoons of kava root powder with a pinch of soy lecithin and lemongrass and about 6oz of water. Alternatively you can combine the entire bags of root powder, soy lecithin, and lemongrass with about 1/2 gallon for a large batch. Blend these ingredients together in a blender or food processor for a couple minutes until they are thoroughly mixed. Next you will want to pour the mixture through the muslin strainer bag to filter out any remaining solid particles. This makes it smoother to drink and better tasting. Take a little bit of time to ‘knead’ the muslin bag to squeeze out as much liquid as possible. This may feel tedious but the last drops to squeeze through the bag are the most kavalactone-rich. Hope this helps! And if you have any other questions feel free to email us at shop@kava.com. How much of the actual Kava product is included in this starter kit? Great kit for any level of kava experience! First off, I absolutely love the tin and quality of all the products contained in this kit. I’m fairly new to kava, I’d say I’m more of an intermediate level than a beginner, but this kit will suit all of your needs no mater what your skill level is. Anyway, the powdered kava root plus is just the right level of “happy” and definitely helps me unwind after a long and stressful day. The acacia cups I absolutely LOVE! I love observing tradition and this kit really helps me do that. The size of the muslin bag is also great – very large. I’ve had trouble with the smaller ones in the past. One more thing – the instructions really REALLY helped me out! I’ve read so many different articles on the preparation of kava online, and they all say something different. I will forever follow the easy instructions that were included in this kit. I would highly recommend this product to any level of kava connoisseur. This site and company is the best when it comes to kava! I’m totally new to the kava experience. I found kava as an effective alternate to valerian as a sleep aid, but jumped on it when I read that it could help with anxiety as well. This kit is perfect for a beginner like me. The storage tin is larger than I thought and very nicely made. I have a great deal of kava, soy, and lemongrass to get started. It comes with a large strainer bag to separate the kava and the liquid. The two wood cups are so cute, and feel very authentic. And for the price, I am ecstatic to try it! I would certainly recommend this for anyone who is interested in trying kava! This is a cute little kit and makes some amazing kava. What I loved the lot is the experience of making my very own batch of kava. It was fun and I really enjoyed it. Another good note I would like to add is that the kit includes all the right amount of ingredients and its easy to prep. It is also fun to experiment with regarding flavor adding. I followed the kits recipe with the coconut milk and coconut water and it tasted pretty good. Overall I was excited getting this kit I loved the two bowls it comes with, I drink all my kava with them. I loved how easy it was making the homemade kava, the tin where everything comes in is really nice. I use the tin to store all my kava products. If you haven’t bought this product yet , you should ..beginning kava drinkers or experienced, this is a great little kit to have.